Earlier this year I began a collaborative teacher inquiry that would set up a technological framework for supporting literacy in the lives of our students, and increasing knowledge. My framework fit very nicely with Ruben Puentedura’s SAMR model. The following is an example of one way I am incorporating the SAMR into literacy. What is the SAMR? Framework for integrating technology into practice. Possible entry points. Just an organizational principle, but does not have to follow this plan. Just suggestions/framework, then we can decide where we want to go next. Examples embedded. Taking the literacy already being done with the Forest of Reading and substituting what students are already doing with traditional literacy, with for example, reflections on a blog, book trailer on iMovie (if you have access to an iPad) or book talk on Prezi. Any web-based platform accessible from school laptops. Other ideas?? Include something new – enhance the presentation with audio, images, links, sound effects, animations, background music etc. 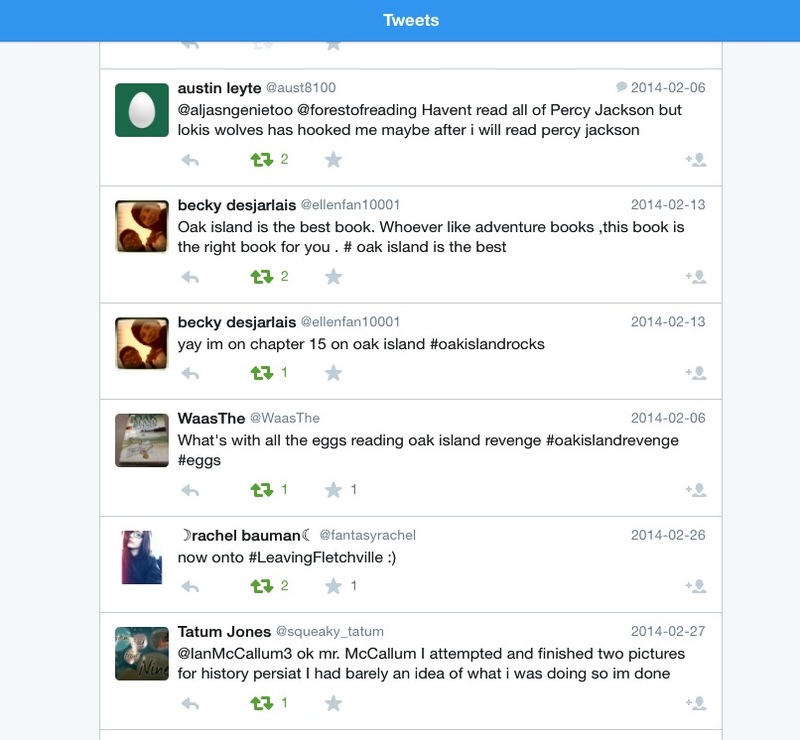 Elicit feedback from other students in the class – tweeting the information and commenting to each other. Sharing blog posts, tweeting links to prezi for book talk, etc. other ideas?? Sharing tweets of blogs and links etc. with other students and teachers, authors, illustrators, publishers, Ontario Library Association to make more connections. My framework included a blog, website, and twitter accounts: @SCDSBforest and @SCDSBbookclubs, and now also @forestofreading as the organizational structures in cyberspace. A way to organize connections between students and knowledge across diverse communities, environments, cultures, and people. A technology supported learning environment and growing connections between students and staff that would help students to step outside of the micro-cultures that exist within our classrooms, and find their voices and passions. We used twitter, blogs, iMovie, and held an online book club on Skype between 2 different schools within the same school board, facilitated by @mswift with subsequent google form data. But the technology was applied to an already ‘well-oiled literacy-machine’, with the purpose of not just incorporating technology-enabled learning environments to our literacy programs, but also to add opportunities for promoting student voice. More importantly however, I believe that literacy is directly connected with knowledge building and knowledge creation. This is because literacy is designed to support students to organize information in meaningful ways that creates new knowledge. It is important to move beyond the technology, and address the key pedagogical traits that we must apply to help us truly understand whether students are able to retrieve and apply their knowledge in meaningful ways. It is also essential to provide the virtual structures to help organize the entire literacy process. Literacy has the potential to go far beyond book knowledge and basic literacy skills. There are opportunities and possibilities through technology that can help with the integration of more complex tasks that foster knowledge building and development. There are additional opportunities for linking the social and emotional development as well. Opportunities for the students to connect with the characters and storylines, and then in turn use technology to connect with the creators of the characters and stories, other students from diverse backgrounds, and other educators, the list goes on. Then, students are able to share personal connections, and pulling together the different pieces of knowledge from various aspects of their lives and create new knowledge. This also promotes digital citizenship. I also believe that through the use of technology, we can supplant positive interactions and collaborative environments that may be lacking in our own classroom micro-cultures – one classroom, one teacher, and one group of students will never be the best environment for all students. Therefore, I believe that we can increase the likelihood of helping students to increase their personal learning, growth, understanding of themselves, and ultimately their performance in multiple literacies. Please check us out! Get involved! Let us know what you think! In addition to: Facebook, Tagboard, Storify, and the list will continue to grow and evolve! Last but not never least, feedback is essential. The organizational structures need to have embedded feedback throughout. Feedback is the glue that links everything that you have been doing. It links essential skills, digital citizenship, learning skills, overall expectations. It validates student voice. It enhances student voice. Further, we recognize that feedback can come from others – via online book clubs, online Forest of Reading, via students or teachers across Canada, via Authors, Illustrators, and Publishers. Self-assessment, teacher assessment, can help students to understand what they are looking at, and go beyond the basic principles of learning and reinforcement. Teachers can use technology in a myriad of ways to purposefully engage in all of the important components of literacy. I look forward to continuing on this journey, and adding depth and breadth to this inquiry in the years to come! This inquiry is something that I will most certainly continue to build with @mswift! She is a fantastic partner @mswift with whom I will be continuing to work with throughout the upcoming school year. Come learn more about this program at the BIT conference in Niagara Falls this November with a wonderful partner of mine and one who greatly helped out with this project: @mswift – We are very excited to be presenting this information! I would love to hear your feedback, and would also hope that you will connect with us in the upcoming school year! Additional information about how we will incorporate the Forest of Reading into our Literacy program this year!